After months of preparation and piles of paperwork (it’s France, remember) we got hitched at the local mairie on Saturday. In a year of the weirdest, wettest weather, would it have been too much to ask for a dry day? 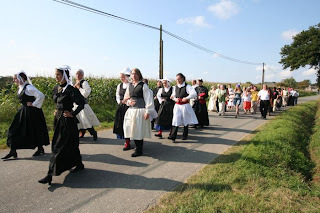 Especially as we had invited the traditional Breton dance troupe (that Gabrielle plays violin with) to serenade us down the road, all in costume, during the quarter of an hour walk between our house and the mairie . Dry? We had blazing sunshine, as you can see in the photos. We asked several friends to bring plates of canapés for the vin d’honneur, two hours of drinks to precede the wedding meal for family, close friends and neighbours. 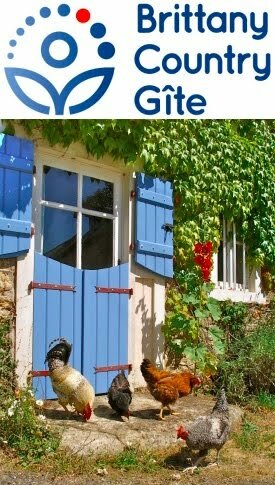 We had the archetypically French chef—huge beer belly, huge moustache, huge laugh—turn up with a refrigerated lorry and cooking trailer to roast a pig, along with a couple of helpers to keep everyone fed and watered all day and late into the evening. The wedding “cake” was the traditional pièce montée —a pyramid of filled profiteroles, glued together with a hard toffee (made at our local boulangerie) served with more fizz, during which time I delivered my speech in two languages (to laughter and several corrections by the French half of my audience). 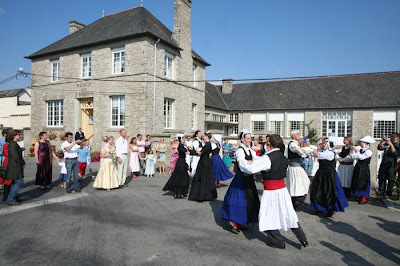 We continued on into the evening, with many of the people who were at the mairie and vin d’honneur coming back and others joining us, including Les Gourganes —the other group Gabrielle plays violin with—to serenade us again, this time with bawdy French sea-shanties. 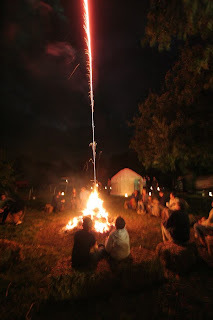 We had bonfire (not strictly legal until the 1st October) and a few fireworks and stayed up ’till the early hours, sitting on straw bales in a circle around the fire, with friends Nick and Tab playing their guitars, leaving a few of us quite exhausted the following day (see pic of little Tilly below). Awww. What a fantastic day. 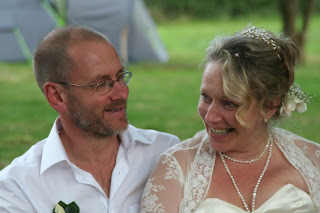 The bride looks lovely, the groom sober and the sun shone. 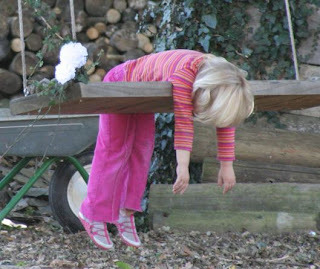 I wish you both much bonheur and beaucoup de mulching. Congratulations!!! Have a great tome in Barcelona! Congrats! Sounds and looks as if it was a great wedding--sorry we missed it. Someday we will make it over to visit you---we just unfortunately could not for your big day.